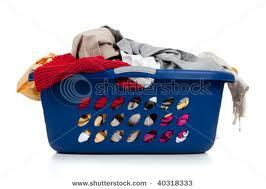 My life is like a laundry basket. Wow, that does not sound too terribly profound or exciting! I came to that conclusion this morning as I carried a meager load to the laundry room before work. I looked at my basket and it was nearly empty. For whatever reason, my laundry basket has been a thermometer of my stress level as a Mom. I can remember thinking, if I can just get this laundry under control I will be able to breathe! It seemed that every time I could almost see the bottom of the basket, or some days the laundry room floor, another load of clothes would just show up! When all 4 kids were small, the basket was always full of little socks, onesies, outfits with spit up, and wet little underwear of the child that was currently being potty trained. Soon, that laundry room was full of white shirts, plaid skirts, and navy pants as the 4 kids were in grade school uniforms. The high school days brought more laundry…and very smelly laundry. I had sweaty socks, running shorts and shirts and the dreaded football practice pants and jersey that literally “walked” into the laundry room on Friday afternoons after a week of sitting in a football locker. I would wash and fold and then see those same sweaty smelly socks (inside out, my pet peeve) return the next day it seemed. Soon that basket began to empty. As one child after another left for college, but it was only temporary. Believe me, the laundry would come home again on breaks and for the summer. When the college kid came home, I was greeted with a hug and a lot of laundry that needed a little extra stain stick, a little hotter water, and a little better folding. This morning my basket was nearly empty. It has been that way for most of this year as Brad and I have entered that “empty nester” phase. It seemed strange at first to have that nearly empty basket, but Brad and I have really enjoyed many of the perks of getting used to just the two of us again. Well guess what, next week, our 2 children that are still in college are heading back home. As I stand in the laundry room I get a little flood of excitement about what the next few weeks will bring. We will have some activity in the house, noise after 10:00 pm, a few extra friends that drop by and raid my pantry, a little bigger grocery bill, a dinner table with a few more plates and a couple of kids that will actually want me to cook, some late night conversations about life, bathrooms with toothpaste on the mirror again, conversations about picking clothes up off the floor, a few more cars in the drive, and yes….all the “stuff” they bring home in bins, bags, and boxes. Do you know what else? My laundry basket will be full again, and I can hardly wait. ← Want dry nights ahead? Try going without the Pull Up! This made me smile! Very exciting! Hope you have so much fun with your ‘kids’ when they come home!! Thanks for your comment and your nomination yesterday!! I will post soon about that!